Nothing says hospitality like a refined crystal lamp, and the Sullivan is a masterpiece of a lighting piece! Evoking the epitome of elegance, this table lamp greets your guests in regal style, boasting only the highest level of craftsmanship and breathtaking wedge and diamond cuts throughout. With glimmering crystal and gold-tone accents, it shines like an elaborate chandelier - only you don't need to crane your neck up toward the ceiling to admire it. 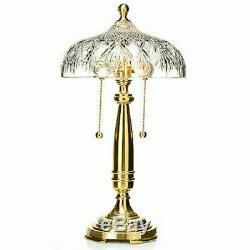 Material: Crystal and base metal. 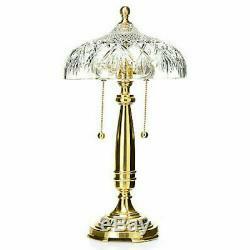 Shade Dimensions: 10"W x 4-1/2"H. Base Dimensions: 6"W x 6"H. Bulb Type: Two 40-watt candelabra or CFL/LED equivalent bulbs (not included). 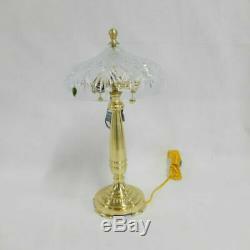 Country of Origin: Crystal: Slovenia / Lamp: USA. The item "Waterford Crystal 18.5 Sullivan Wedge & Cross Cut Table Lamp NEW IN BOX" is in sale since Friday, March 15, 2019. This item is in the category "Pottery & Glass\Glass\Glassware\Waterford". The seller is "joakatfer" and is located in Sagamore Beach, Massachusetts. This item can be shipped to United States, Canada, United Kingdom, Denmark, Romania, Slovakia, Bulgaria, Czech republic, Finland, Hungary, Latvia, Lithuania, Malta, Estonia, Australia, Greece, Portugal, Cyprus, Slovenia, Japan, China, Sweden, South Korea, Indonesia, Taiwan, South africa, Thailand, Belgium, France, Hong Kong, Ireland, Netherlands, Poland, Spain, Italy, Germany, Austria, Bahamas, Israel, Mexico, New Zealand, Philippines, Singapore, Switzerland, Norway, Saudi arabia, Ukraine, United arab emirates, Qatar, Kuwait, Bahrain, Croatia, Malaysia, Brazil, Chile, Colombia, Costa rica, Panama, Trinidad and tobago, Guatemala, Honduras, Jamaica, Antigua and barbuda, Aruba, Belize, Dominica, Grenada, Saint kitts and nevis, Saint lucia, Montserrat, Turks and caicos islands, Barbados, Bangladesh, Bermuda, Brunei darussalam, Bolivia, Ecuador, Egypt, French guiana, Guernsey, Gibraltar, Guadeloupe, Iceland, Jersey, Jordan, Cambodia, Cayman islands, Liechtenstein, Sri lanka, Luxembourg, Monaco, Macao, Martinique, Maldives, Nicaragua, Oman, Peru, Pakistan, Paraguay, Reunion, Viet nam, Uruguay.